Choose a custom solid wood desktop to match your style with our growing collection of woods and finishes. Have a question? Call us! Want a desk now? Adding a temporary scratch and dent desktop cuts down on your lead time and allows you to start standing at work quicker. Increase your storage space with our sturdy and handcrafted teak credenza. It ships fully assembled and is discounted when bought with a desktop! We recommend choosing a desktop care kit for your solid wood top to keep your desk looking brand new! This area can only be reached by leaning over the desk itself or getting out of the chair or both. Things that aren't used very often, like books, monitor stands, external hard drives, and decor should be placed in this zone. We're proud to offer more than a dozen species of solid wood, along with multiple stain and barkline options so that you can build the desk you want. Our expert woodworkers have years of experience with these woods native to Texas, and have been chosen by us specifically for their speediness and attention to detail. Each desktop is custom-made and one-of-a-kind, so your finish may vary slightly from what is pictured. Expert advice on how to care for your desktop, as well as how to resolve any issues that may arise. Handmade wood furniture requires some basic maintenance on your part to keep it in tip-top shape and looking great for years to come. Beautiful craftsmanship, modern design, and eye-catching reclaimed lumber are just a few reasons why the Teak Credenza is so sought after. Handcrafted by the same woodworker that makes our reclaimed teak tops, you'll have a matching accent piece that ups the style and storage in your office simultaneously. Protect your investment with the Care Kit for Solid Wood Desktops. When your wood top needs a revival, this is the kit to restore it to its former glory. The kit comes complete with five furniture polishing cloths, one 16 oz. bottle of Old English lemon oil, and one steel wool hand pad. Every UPLIFT Desk Solid Wood Desktop is made to order by our local expert woodworkers, and crafting these beauties takes a little time. This means that some of our Solid Wood Standing Desks may have longer lead times. When you need your desk sooner than the estimated ship date we have listed, we have a selection of temporary scratch and dent desktops that are ready to ship now in our warehouse in Austin, TX. These tops are fully functional, just maybe with a ding, scratch, or dent here or there, and are economical solutions to get you working quicker. When you tell us you want a temporary top, we'll get ready and ship you the best one we have in stock in the closest size to your Solid Wood Desktop. If your desktop's size is not standard, we'll ship the next smallest size. For example, if you order a 55" desktop, we'll ship you a 48" scratch and dent top. Enjoy your temporary desk setup with a Walnut, Ash Gray, Maple, Cherry, or Mahogany laminate desktop. You'll have a stand-in top to complete your desk until we can ship your Solid Wood Desktop to you. With a name like that, you know it has to be luxurious. Here's your opportunity to customize your workspace with a beautiful solid wood desk made just for you. We don't keep these tops in stock. Rather, you get to pick from a dozen available styles, with tones that run from light to dark and, in some cases, barkline edges. And the desktop is cut to your specified width, so that it fits your space perfectly and provides all the working room you need. Your custom desktop will rest on our re-engineered, reinforced, patent-pending UPLIFT V2 Frame (available in four colors). Wirecutter loved this frame (paired with our bamboo top) so much, they named it the "Best Standing Desk." Its increased stability, versatility, and functionality mean you get a desk that can do even more to help you accomplish your biggest goals. Click here to learn more about the UPLIFT V2 Frame, as well as our UPLIFT V2 Commercial Frame—and compare the two. Select your solid wood top from 12 different styles: dark ash, natural ash, premium maple, dark pecan, natural pecan, white oak, sipo mahogany, premium cherry, premium bamboo, premium walnut, cedar, and mesquite. For cedar and mesquite, you can also choose a natural edge—a barkline—for the front and/or back. It's a nice touch that brings an organic feel to your workspace. Tell us how wide you want the desk to be and we'll cut it to within a 0.25" tolerance. Please note that we recommend a width from 42" to 80", for proper frame support. All tops, with the exception of bamboo (1.5"), are cut at a 1.75" thickness, making for a desktop that can endure for decades. Because we make these desktops to order, lead time is 6-8 weeks—but this is a desk you can love for a lifetime. You can also order this desk in an L-shape, if that's what you need. And we have in-stock solid wood desks, if you don't want to wait. Check out our Desktop Brochure for even more options. Why Choose an UPLIFT Desk? We redesigned our frames to deliver even more with regard to stability, safety, and reliability. 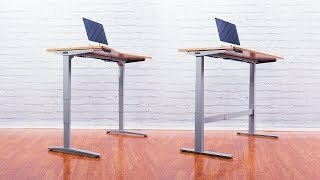 Whether you choose the UPLIFT V2 Frame or the UPLIFT V2 Commercial Frame for your solid wood desk, you're getting so much more than a typical standing desk offers. Built with contract-grade quality and long-term use in mind, they're just as exceptional as the desktop that will rest on them. Click here to learn more about both the UPLIFT V2 Frame and the UPLIFT V2 Commercial Frame. The UPLIFT V2 Frame adjusts over a height range of 24.5" - 50.1" (without a desktop). Most of our customers choose this frame: it's quick, quiet, and reliable. And it includes several innovative design features. The UPLIFT V2 Commercial Frame can be set anywhere in the height range of 21.6" - 47.7" (without a desktop). This frame has lower minimum and maximum heights, as well as a bigger height range, compared to the other frame. That's because this desk is made to the ANSI/BIFMA G1-2013 height standard, which many large companies around the world have to comply with. The UPLIFT V2 Commercial Frame is designed to support ergonomic working postures for 5th percentile females through 95th percentile males in seated and standing positions. One of the most unique design features of our new frames is the integrated mounting point system (patent pending). We included 48 individual spots where you can quickly install your choice of UPLIFT Desk accessories—without having to drill any holes or drive any screws. And they hide under the desk, so you don't see them while you work. We have several accessories in the works that can take advantage of this system, including power strips, CPU holders, and desk extensions. Our first accessory available is an under-desk hammock—which just goes to show you how sturdy our frames are. Snooze with confidence for as long as you need to, and then hop right back to working on your favorite project. Please note: the hammock is only compatible with the UPLIFT V2 Frame. It’s not compatible with the UPLIFT V2 Commercial Frame because it interferes with the stability crossbar. You already invested in the ultimate desktop, so why not ensure you have the ultimate keypad to go with it? Instead of pressing the up or down buttons every time you want to change desk heights, use the Advanced Keypad. With four memory presets, you can program different one-touch settings for each of your working postures. Just press the button and let the desk spring into action for you. This keypad also gives you control over the anti-collision sensitivity, which is a safety feature that stops the desk when it comes into contact with anything. In addition, there's a child lock that you can use to keep the desk from moving at all—for added peace of mind. You can also use the keypad to set a maximum and minimum height for your desk, preventing it from bumping into anything above or below the desktop surface. To top it all off, 10 seconds after you press any keypad button, the LED display will dim, to help minimize distractions. We're honored to be selected by both Wirecutter and Forbes as the makers of the "Best Standing Desk." We're also thrilled that Wired, Lifehacker, and many others have rated us #1. Take your place among the hundreds of thousands of happy UPLIFT Desk customers, including hundreds of Fortune 500 companies. From the bottom of our hearts, we want to thank you for all of your support. We started UPLIFT Desk based on your feedback; and our continuing goal has been to help every individual and every office build the workspaces they need to accomplish their biggest goals. Our team is committed to keeping our prices low, while delivering desks that meet the highest standards of quality. Because of your support over the years, even more people are working better and living healthier than ever. Thank you so much—we couldn't have done it without you. Don't forget about one of the most important aspects of your workstation: power. We offer in-desk power grommets, clamp-on power modules, and surge protectors—all designed for height adjustable desks. Instead of using a wall outlet, power your electronics from the desk, which helps prevent cords from pulling out when you make height adjustments. Once you have everything plugged in, take a look at your cables. If they're loose on the desktop, or hanging underneath, you'll want to do something about that. Not only do loose cables look disorganized but also pose a safety issue. Because your desk moves up and down, they can get snagged and pulled, possibly unplugging them or damaging equipment. We have several wire management solutions that can help organize your cables, producing a tidy—and safe—height adjustable workspace. And to get you started, we include a wire management tray with your UPLIFT V2 Special Order Solid Wood Standing Desk. Don't stress—we'd love to help you plan out your office. If you're considering four or more UPLIFT Desks, we can design your office desk layout at no charge. There's no need to wait until the desks arrive—and then to spend a day or two trying to figure it all out. Just complete four simple steps, and we'll configure your desk space for you. You can rest easy knowing that you have a plan for your new desks. As an added bonus to your desk layout, you'll also receive a discounted quote for your order. What is the difference between the 1.5"-thick premium bamboo and the 1"-thick bamboo offered on in-stock desks? Besides giving you an extra 0.5" of thickness, the standard bamboo top is a UV-cured bamboo that we stock in our warehouse. It comes with or without a center cut-out and will ship out in 1-2 business days. The premium bamboo is made from fully matured Moso bamboo. This denser bamboo features a beautiful vertical grain. Each desktop is custom-made to order and ships out in 6-8 weeks. Carbonized bamboo has been treated to give your desktop a beautiful brown-honey-caramel finish—which really makes a statement in the office! Absolutely! Every UPLIFT V2 Special Order Solid Wood Standing Desk is made after you place your order, which means it can be built to your preferences. Changing the desk size won't increase the lead time, either. Contact our customer service team for a quote. Why is the lead time so long? Can I get my desk any faster? Think of your custom solid wood desk like a fine bottle of wine: it takes time to make it just right. Each desktop is custom-made by our woodworkers after you place your order. A solid wood desktop can't be constructed in just a day; it takes time to cure and finish the desktop. We know it's difficult to be patient, but this desktop is worth the wait! I really don't want to wait, but I also don't want to compromise on getting a solid wood desk. Are there any other options? We do carry quick-ship solid wood desks. These desktops have been crafted by our woodworkers and are ready and waiting in the warehouse. That means we can get them to you quickly! You will just have to choose from the sizes and species we have available in stock. Can I get this with the ergo edge? Unfortunately, ergo edges are not available on our solid wood desktops. How durable is solid wood? At 1.75" thick, these desktops are beasts. Solid wood is a very durable surface and will harden over time. However, the surface may get scratched or become dull if you don't maintain it. If you live in a very dry climate, you will need to keep your desk hydrated with lemon oil. Otherwise the wood may dry out and crack. How should I care for my desktop? We combined all of the maintenance items needed to care for your solid wood desktop in one simple kit. You'll clean the surface of your desktop with lemon oil, which also helps keep the wood properly hydrated. Use the oil with furniture cloths to help polish the surface. If scratches do occur, you can gently buff them out with the steel wool pad. Can I pay more to get my desk faster? Unfortunately, no. Each desk is handcrafted, and the entire process takes a while. Check out our in-stock solid woods or our sales and clearance desks to see if anything suits your needs. I just received my desk and the color of the wood looks a little off. Are you sure that this is the wood I ordered? Although we are not perfect, it's more likely that your freshly harvested desktop looks a little different than a mature desktop. Different wood species either get a little lighter or a little darker as they age. Over time, the color will eventually even out. Can I expect to get my desk in the specified lead time? Right now, solid wood desks take 12-14 weeks to build before they are shipped out. With about one week in transit time, you can expect to receive your order in three-and-a-half months. Cedar and mesquite desktops are available with a barkline, or "live edge." This natural edge follows the curve of the wood and provides a unique, rustic look. How can I feel good about chopping down a tree for my custom desktop? We've partnered with the National Forest Foundation to plant five trees in U.S. national forests when you buy a solid wood desktop. You can rest a little easier at night knowing that the new trees will help beautify our national parks. Will the desktop surface be smooth? Natural wood is—well—natural and may contain some bug holes, knots, and imperfections. Our woodworker smooths these out by adding either black or clear filler to the surface of the desk. Does the weight capacity include the weight of the desktop? The load bearing capacity of the frame does not include the desktop. Since each desktop is a different size, we have included the desktop weight in pounds per square foot for each species, so that you will be able to calculate the weight capacity for your custom desktop. Say you get a 72" x 24" desktop in pecan: your desktop will weigh 111.6 lb. That still leaves you with 243.4 lb of computer equipment and office accessories that you can evenly disperse across your desk! Will this desk work well with a treadmill? If you want to put a treadmill under your solid wood desk, just make sure you order a desktop wide enough to comfortably fit a treadmill on one side and a chair on the other. You will also want to order a monitor arm, so that you can easily swing your monitor back and forth between your treadmill and your chair.